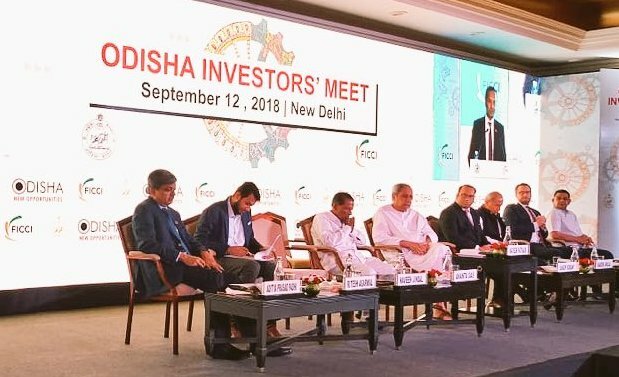 ONI Bureau: Odisha Chief Minister Naveen Patnaik today attends Odisha Investors’ Meet in Delhi, ahead of ‘Make in Odisha’ Conclave, scheduled to be held from November 11-15 this year. Industry Minister Ananta Das, Chief Secretary Aditya Padhi, Naveen Jindal, Ritesh Agarwal, Founder and CEO, OyoRooms, Harish Ahuja, top business leaders and several industrialists are also present at the event. State industries department in collaboration with its industry partner Federation of Indian Chambers of Commerce & Industry (FICCI) will organise a road show in New Delhi today to invite investors for Make In Odisha Conclave 2018. State Government in a press release said that the investment promotion efforts of the State are focused towards sustainable industrial growth leading to increased employment opportunities and all round development. As per report, companies across sectors like petrochemicals, textiles and aluminium downstream have dangled the promise of investments valued at around Rs 100 billion.